Pharmacy in History publishes essays on the history of pharmacy practice, science, education, and industry, including the history of drugs and therapeutics and facets of the related medical sciences. The journal solicits manuscripts not exceeding 10,000 words (exclusive of footnotes) and also invites submission of scholarly notes, generally no longer than 3,000 words (exclusive of footnotes). All scholarly manuscripts submitted undergo a peer-review process. Book reviews are assigned to specialist scholars, and authors desiring Pharmacy in History to carry reviews should arrange for their publishers to send copies of books to American Institute of the History of Pharmacy, Pharmacy in History, 777 Highland Ave., Madison, WI 53705. Download a .pdf version of these complete Guidelines for Authors. Conflicts of Interest: It is the responsibility of the authors (via the corresponding author) to inform the editors of any institutional or organizational funding they have received for research related to the subject of the manuscript. Authors must also declare any additional financial or personal connections that represent potential conflicts of interest. Manuscript Composition: Send a copy of the manuscript via email (PH@aihp.org) to Greg Bond, Senior Editor, Pharmacy in History. The manuscript should be submitted as a Microsoft Word document (or similar word processing format). Please do not submit manuscripts as .pdf documents. Notes should appear at the end of the document. Authors are encouraged to submit illustrations, with captions, to be printed with the manuscript. Scans and digital images should be high resolution (at least 300 dpi) .jpg or .tif files in grayscale. If illustrations are copyrighted, authors should obtain clearance as necessary. Complex tables or graphs should be submitted as digital images. For composition and styles, follow the Chicago Manual of Style . Leslie G. Matthews, History of Pharmacy in Britain (Edinburgh and London: E. & S. Livingstone, Ltd., 1962), 57. Charles E. Rosenberg, “The Therapeutic Revolution,” Perspectives in Biology and Medicine 24(1980): 241. Matthews, Pharmacy in Britain, 63. 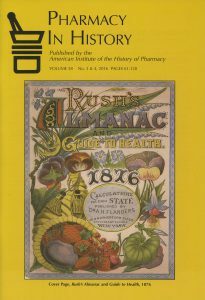 “Pharmacy Museum Opens,” American Institute of the History of Pharmacy, http://www.pharmacy.wisc.edu/aihp/museums.htm (accessed 11 June 2008).